Who doesn’t love ninjas? Whether you’re a fan of the old martial arts movies from the 70s, or the actual, historical accounts of peasants fighting against oppressive governments, or if you simply enjoy yours in a half-shell, there’s probably some form of ninja you like. 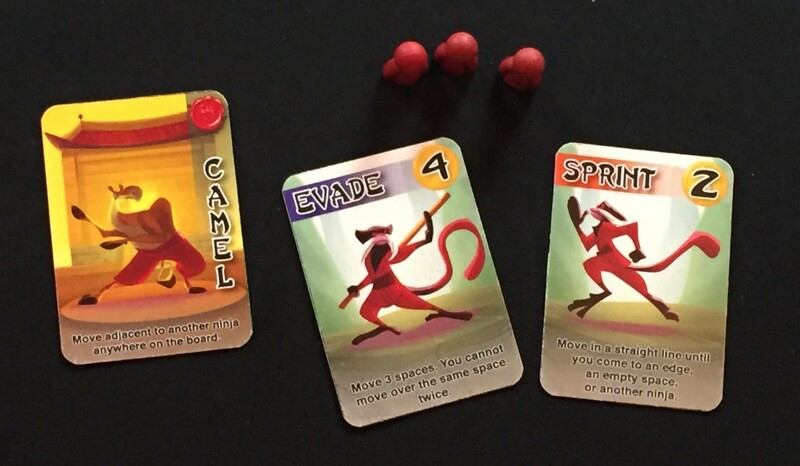 While not specifically a ninja, I do enjoy me some “Chinese Boxing Ailuropoda melanoleuca.” The fellows over at Action Phase Games also enjoy some ninja action. But how does a ninja become a ninja? Is there a school for something like that? 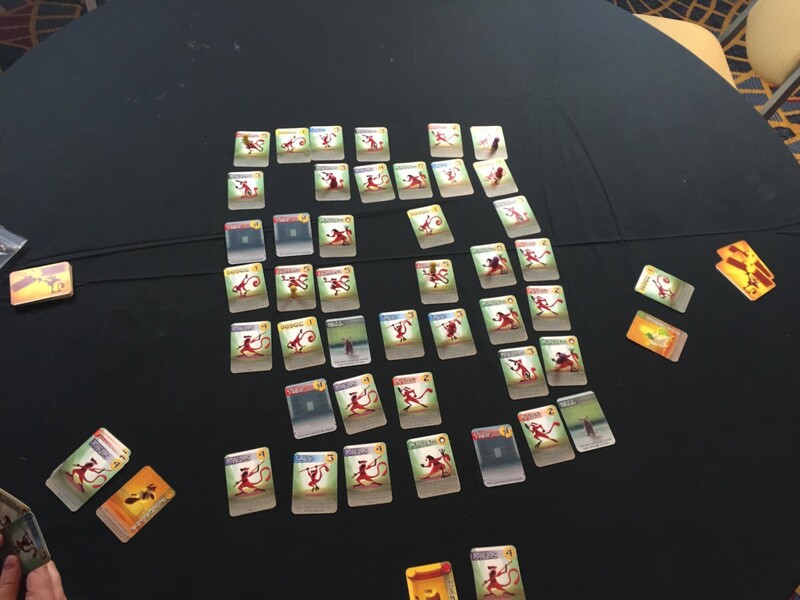 The fellows at Action Phase are going to answer that for us with a resounding, “Hai!” as they introduce us to Ninja Camp, their new card game. 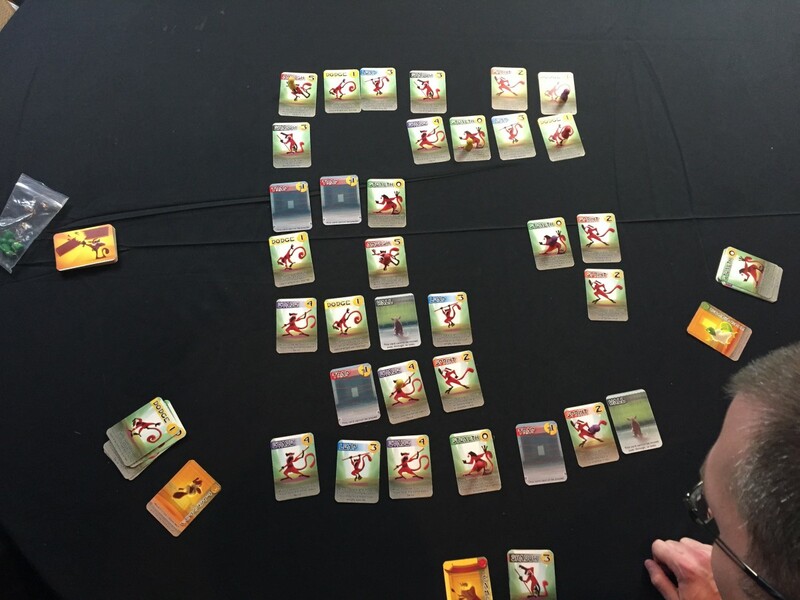 During CMON Expo 2015, Travis (and all his tattoos) from Action Phase Games showed Jared and myself a prototype version of the game (so yes, the cards will look much better in the final version). 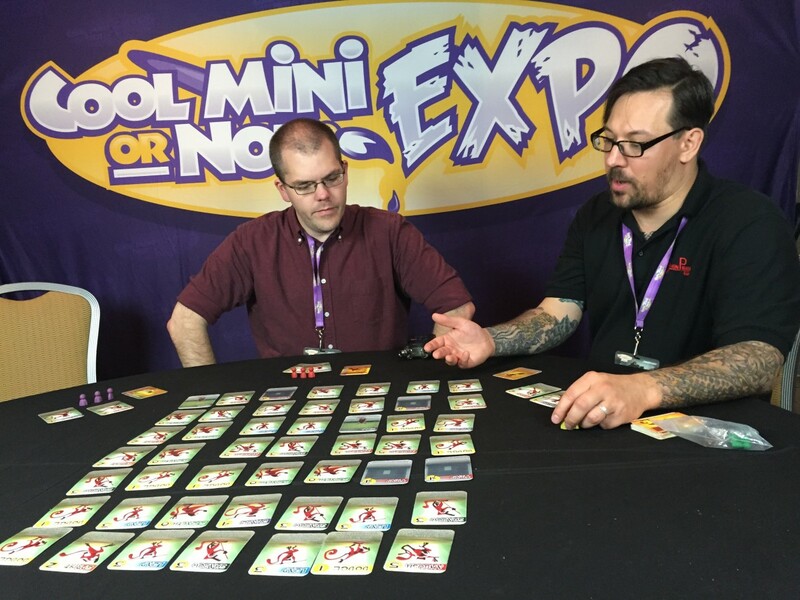 The game is the second in their “Small Box, Big Fun” line of games (the first being Scoundrel Society, which we also got a chance to take a look at and whose Kickstarter recently ended). It was designed by Adam Dalton. This is the first time Action Phase has used an outside developer for one of their games. If you’ve played the game Hey, That’s My Fish, some of the elements may look a little familiar. In the game, each player takes on the role of a ninja in training. Each character is an anthropomorphic animal that you might not really consider top-ninja-material. For example, we were using the Camel (Jared), the Platypus (Travis), and the Chameleon (Me, as there were no Polar Bear cards… maybe in an expansion or as a stretch goal). Now, before you say, “but chameleons would make great ninjas!” I want to remind you of how a chameleon walks. Yeah, go look up a video of it. You’ll see they don’t tend to go anywhere fast. So yeah, each of these creatures is sort of the “B-Team” or maybe “C-Team” of critters that could/would/should become ninjas. However, each of us does have a secret weapon. Each character has a once-per-game special ability. Most of them allow you some extra-special form of movement. You’ll see why that’s a good thing once we get into the gameplay. Along with the Ninja Clan Card (the name for your special ability card), you get 3 pawns that represent your trainee ninjas out on the grid of cards. Finally, you get a starting hand of one Sprint card and one Evade card (more on what those do here in just a minute). From there, setting up the game is rather simple. 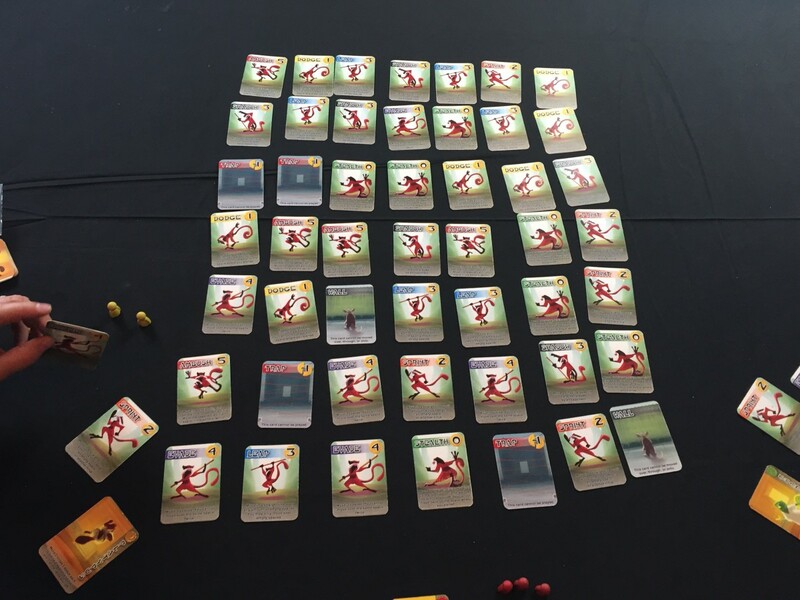 Depending on how many players you have, set out a grid of cards out on the board. For a 3-player game, we used a 7x7 grid. A 4-player game would have used a 7x8 grid. This grid is made up of other cards like the aforementioned Sprint and Evade cards (collectively known as Training Cards), but also of various Obstacle cards. There’s more cards in the deck than you’ll have out on the grid, so you’re never guaranteed to have a certain set number of any particular card in play for any particular game. After the grid is set up, players take turns placing their 3 pawns out on the board on top of the cards. You cannot place your pawns on cards that have the same name, and each card can only have one pawn on it at a time. From there, you’re ready to play. Sprint – Move a pawn in a straight line until you can’t anymore (that is, until it encounters a wall, a place where there’s no cards, or another pawn). Evade – Move a pawn 3 spaces orthogonally (does not have to be all in the same direction. You can turn). 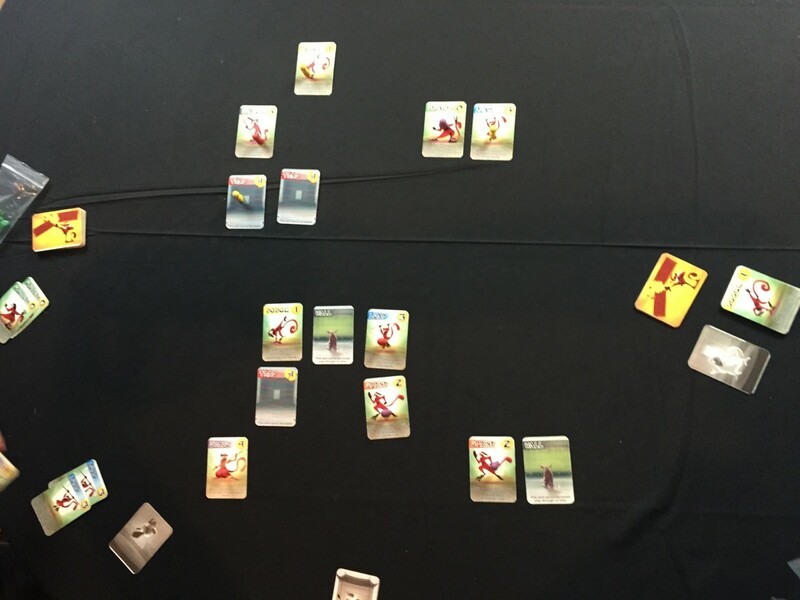 Stealth – Move a pawn 2 spaces orthogonally, pick up the card you leave (as usual) and the card you move first onto (So you get 2 cards when you perform this maneuver, instead of just the usual 1). Leap – Move a pawn over a gap onto the other side. You must start adjacent to the gap in order to perform this maneuver. Shadow – Move a pawn as if you played the last card played by an opponent (I.E. – you copy the card that someone else played). Dodge – Move a pawn up to two spaces, including diagonally (the only card that lets you do so). Ambush – Move a pawn in a straight line until you come to another pawn. Then, push that other pawn onto the next card in line (So you can’t push them off the edge or into a hole, but you can push them onto traps). Wall – This stops all forms of movement. You cannot enter onto or end your movement on a Wall. Trap – You cannot play this card from your hand. Also, it is worth -1 Points at the end of the game. A turn or so in. On your turn, you have three options, of which you will do one. You can play a card from your hand, moving one of your pawns as indicated on that card. When you move, you pick up the card that your pawn started on. In this way, each move you make will diminish the amount of space left on the board (since you can’t move to a place where there’s not a card). If you don’t want to play a card (or you can’t play a card), you can instead choose to use your special power on your Ninja Clan Card. Once completed, flip your card over to show that you’ve used it for the game. Finally, if you can’t or don’t want to play a card or use your Ninja Clan Card ability, you can Pass. However, once you Pass, that’s it. You’re done playing for the game. If a move becomes available later on, you can’t jump back into the game. Where your pawns are sitting is where they will remain (unless Ambushed, that is). How our preview game looked at the end. I really enjoyed playing Ninja Camp. Like, really really. I foresee myself being a frequent camper. The game plays really fast. It is quick to learn and easy to play, but there’s a lot of tactical depth in how you choose to play your cards, what spaces you land on, and when you use your special ability. You might want to pick up a bunch of high-point-cost cards at the beginning, but those cards are generally hard to use once the board is full of holes and everyone’s pawns are right up on top of each-other. 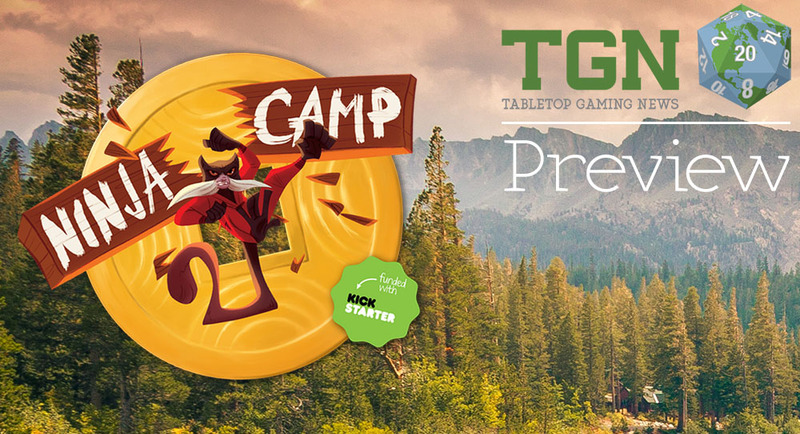 You’ll have a chance to try it out for yourself at Gen Con. I know I’ll be swinging by to get a game or two in during the show. In the meantime, be sure to check out the Kickstarter campaign, running now.